We are excited to be ranked as a world leader in the aviation industry! With Hundreds of Thousands of courses delivered, people and airlines trust the Inflight Institute. We have an outstanding international presence with an impeccable global reputation! Our team is frequently published in international aviation trade magazine and are asked to present to global airline audiences at international aviation training conference on a regular basis. See what our students and airlines have to say about us and our programs…then see for yourself! "Took a certificate course online about 3 months ago, I went for an interview with a member airline and because of that certificate I got the job as a flight attendant! This is a fabulous program." "Since I was a young woman, I have always dreamed of being a flight attendant. Life took me in a different direction, I got married, had a family, owned a successful research company. But I wondered if it was too late for me to pursue my dream. There was only one way to find out, I stumbled on the Inflight Institute and immediately enrolled in the multiple flight attendants on board on line certificate course. And I haven't looked back. Great course covering the many different topics in the airline industry. But the best part of the Inflight Institute was the Inflight Mentor program. They coached me every step of the way, encouraging me to apply to the airlines and next week I have my second interview with a major airline. At my age! I couldn't have done it without them. Thank you." "Thank you! Thank you! I enjoyed the course A LOT! I highly recommend this course to everyone!" "I love this course.... The number one question people ask me is "how do I get a job as a Flight Attendant?" the only thing I say is the Inflight institute!" The course is amazing. It gives you all the information that is required to land a job with Airlines all over the world. If you are like me, and feeling unsure of what to do, give the Institute a call. The staff is amazing, any issues you have they will answer them. Since I completed my course I have been getting calls from Airlines all over the world, interested in having me come for an interview. The way the course is designed it gives you the ability to pass the interview, since you know all about the role of a flight attendant. Thanks a lot Inflight, you are the best. I owe all my success to you." Congratulations to the Newest Novair Crew... We all knew YOU WERE UP FOR IT!!! "I cannot even begin to tell you how I feel. Surprised and excited. Excited as I have an opportunity to work with my #1 airline of choice! I am thrilled.I must say that initially I was apprehensive about the program & just looked at the website for a few weeks before finally calling. After our conversation, I was ready to give it a shot. Wow. I was called for an interview within days of starting the online program. And I was called by my FIRST airline of choice. I have been sending my resume twice yearly for the past 3 years to them, and finally I have been invited for an interview." "It was a pleasure for me to go through your online course! My overall opinion about your course is very good. Your students will discover that a cabin crew's role is not only meal service or traveling around the world, but firstly flight and passenger safety. The design of the site is excellent! All content and media files included in the course were very interesting! 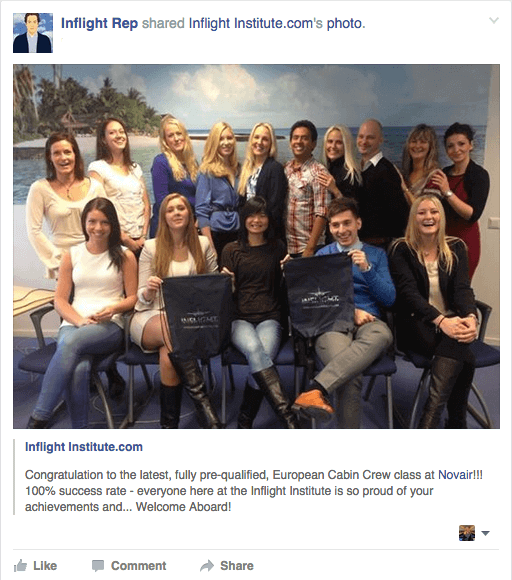 I learned a lot; now I am sure that I am prepared for this role as a Cabin Crew Member." "I was selected to attend an airline's ground school after completing the Inflight Institute Online Flight Attendant training program. Nothing in the airline's ground school was a surprise to me as it was all explained by the Inflight institute!" "I found your course really interesting and useful! I am so impressed with your course that I am passing your name on to others, who I know would be interested in the online program. I am planning to introduce your course to the students at a local college. I am sure there are a lot of people who'd like to join the course!" "I would also like to thank you, as you have definately made my whole experience online a great one! You were quick to get back to me when I had questions and every interaction was a pleasant one. This really exceeds my expectations. So, thank you, for steering me in the right direction. I literally have gone from hopeless to over-whelmed with opportunity. The inflight institute will come highly recommended by me!" "A career as a flight attendant has been both a dream and goal in my life! The Inflight Institute online course is well organized, thought provoking, and interesting. That prepared me for job placement. Within a week of completing this course, airlines were interested in me for job placement. A certificate from the Inflight Institute made my resume stand out from other applicants. I would highly recommend this course to anyone who is interested in a career as a flight attendant; it provides a broad scope of knowledge that prepares students for the real world of the airline industry. Thank You again,"
"After completing the Inflight institute's Online Training Program I've got a job! With an international airline and the online training has really helped me a lot to go through the course and successfully complete it..."
"Everything is going absolutely great, now that I am working as a Flight Attendant. Trust me, the reason I am doing so well is because I took the Inflight institute online training program." "I feel so confident when I'm flying. I never realized how well prepared to fly I was, until I actually got in the air. 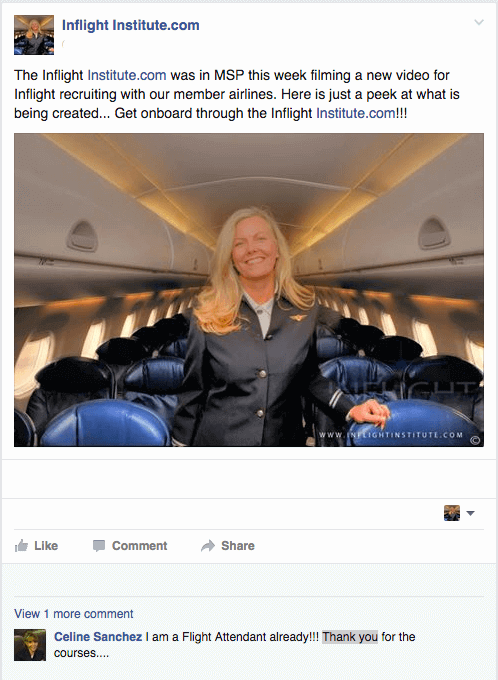 I never second guess myself, and I give all the credit to the Inflight Institute." "While attending training at my airline, I kept saying "hey I already know this stuff." Thank you, Inflight Institute for making my dreams come true! I don't have enough good words to say for what your course did for me. It's the reason I love my lifestyle today." "The number one question people ask me is "How do I get a job as a Flight Attendant?" My answer is ALWAYS, you'll have a ten times better chance if you take the Inflight institute online course. I'm sure at least five people I know are taking this course right now." "Taking this course helped me so much! Trying to get into the airline industry without experience feels like you are walking into something blindfolded. After taking the online training, I was prepared for everything! I was so confident that being a Flight Attendant was the job for me, and I was right! I am now a fully qualified Flight Attendant and loving every minute of it!"